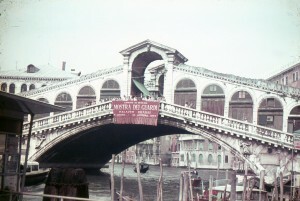 The Rialto Bridge is one of four bridges that cross the Grand Canal in Venice. 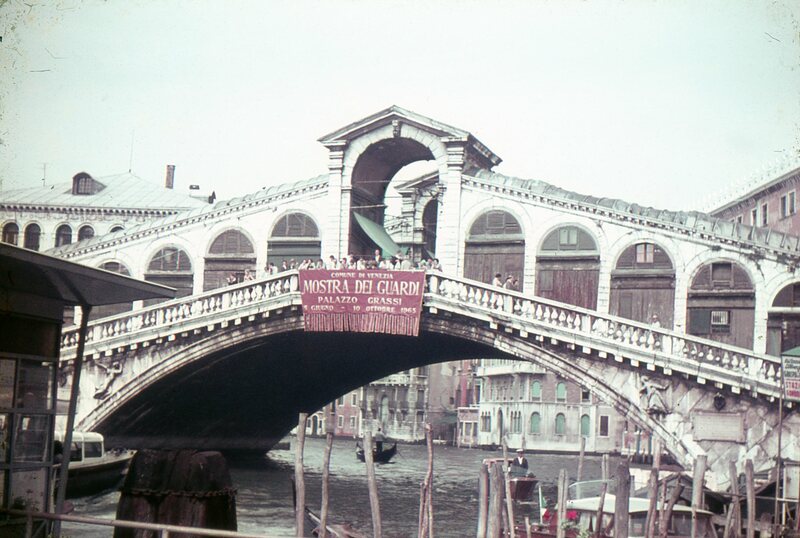 According to Wikipedia the current version was built in 1591. Mostra del Guardi translates to “Watch the show,” and Palazzo Grassi is the Contemporary art exhibition in Venice. No clue what the show actually was, or why it was being advertised on a historic landmark. Of course this is assuming that my translations were correct. I kind of wish I could see the boats a little better as there looks like there are a couple of cool vintage ones in the foreground. I can imagine a city that is continually sinking under the water probably has quite a collection of boats floating throughout it. Can anyone tell if my translation of the sign is correct? Or know what the Show at the Art museum was back in 1965?